Drive south to Amboseli National Park. Game viewing en route to your lodge with the immense grandeur of Mt Kilimanjaro in the background. Amboseli National Park, at the foot of Africa's highest mountain, 5895m Kilimanjaro, is one of the most popular of Kenya's national parks. 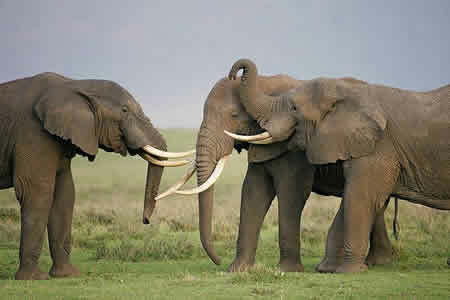 Amboseli National Park provides the classic Hollywood image of Africa. Set in rolling savannah scenery it is dwarfed by the presence of the pink-tinged, snow-capped peak of Mount Kilimanjaro which, at 5,896 meters, is the highest free-standing mountain in the world. Against this magnificent backdrop roam vast herds of elephant accompanied by lion, buffalo, cheetah, giraffe, baboon, gazelle hippo and wildebeest. There are also over 400 species of birds, all manner of reptilian, flora and fauna and some of the most soul-searing views in Africa. The Serena lodge features ethnically inspired architecture, natural material and a glowing selection of local art. The rooms, each with a view over the African plains, blend an authentic nomadic aura with all the comforts of unabashed five star luxuries. Guests can also enjoy an swimming pool fed by the melt-waters of Kilimanjaro and game viewing terraces with full bar service. Dinner and overnight at Amboseli Serena Lodge or Oltukai Lodge, L,D. Full day in Amboseli with game drives in the morning and afternoon. All meals and overnight at Amboseli Serena Lodge or Oltukai Lodge, B,L,D.